This integration is now deprecated! Please view our documentation that enables Retrace access via Active Directory instead. To get and upload your Management Certificate login to s1.stackify.com and go to Settings > Integrations > Azure. 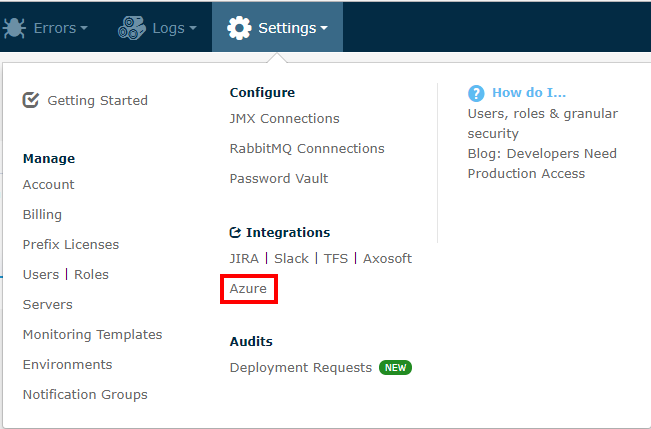 Once you arrive in the Azure Settings click the Subscriptions tab. Click the link and you will be logged in to the Azure Management Portal and automatically taken to your Management Certificate download page, which should automatically start the download of your management certificate. This .publishsettings file will contain the subscription data for any subscriptions that you have access to. Note: All Publish Setting files should be generated after the September 2014 Windows Azure update for the upload to work properly. Select your .publishsettings file that was just downloaded. Select Upload files to upload the .publishsettings file. You should now see your list of Subscriptions (you may need to reload the page in order for the list to show up). 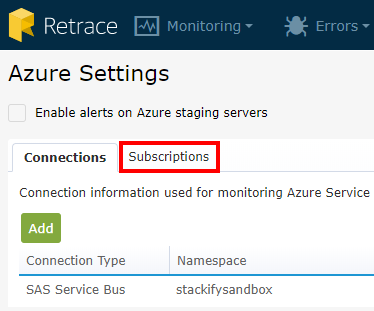 If you are having trouble seeing Azure Server Status on the server Dashboard, you may want to double check that the Subscription ID matches the ID of your current Azure subscription (check here), especially if you have multiple or inactive subscriptions.